I'm planning a climbing trip to Olympic National Park this summer (2006). So in order to motivate myself to start preparations, here are a few shots from the last time I summitted the peak. I have worked hard on the captions to make this into a bit of a climber's guide. This view is from a much higher elevation on the ridge northeast of Mt. Olympus. 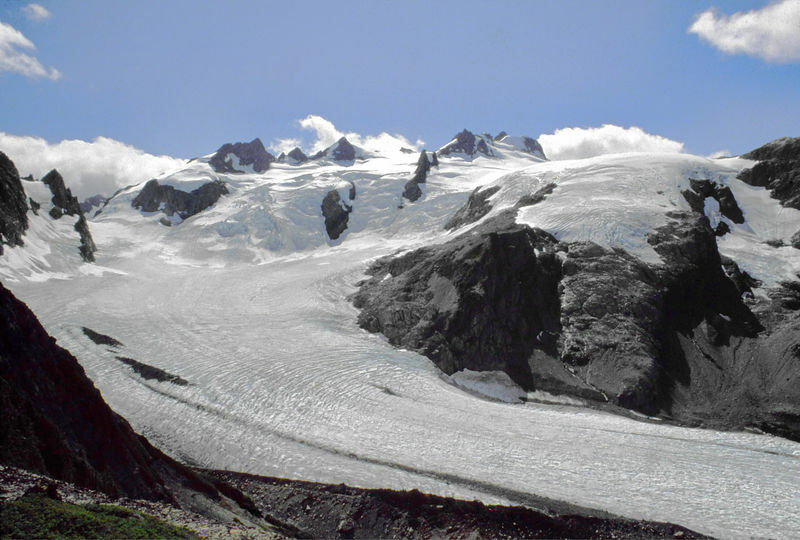 The shot was taken in late August after two solid months of very sunny and warm weather, so almost all of the snowfall from the past year has melted or converted to glacial ice and the glacier is very well defined. At this time of the year, wearing light crampons make an ascent both easier and safer and you still won't take more than a few steps on rock to make your summit. I've included a very high resolution original image for you to browse. The lack of sharpness of the image is due to many factors including the fact that this is a scanned film slide that was 23 years old when I scanned it. If you have film that you'd like to scan, my recommendation is that you get a film scanner and start scanning now. Every month that goes by before you scan will mean more hours of your time restoring what time has taken away from your images. May I add that I've left many of the marks that the ravages of time have left on my slides in these digitized versions to give you some idea of what happens to them, and also to remind myself how lucky I am that there is digital photography which will prevent this sort of thing from happening to the images taken of my future adventures.